Following are updates from July 2017. For example, for more info on harvesting the hay - see the August Life on the Farm blog. Late last week we were able to start cutting the hay and finished over the weekend. Today (Monday, July 31st) we were blowing the hay into the silo. 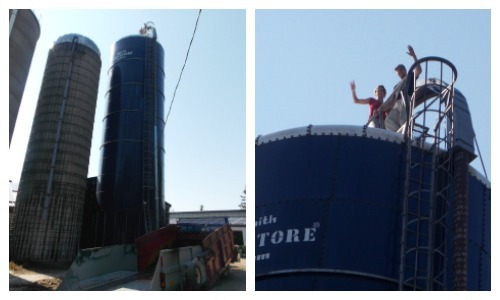 A couple of brave souls had to go to the top of the silo to open the lid. With all of the wet weather we are having problems getting our second cut of hay done. 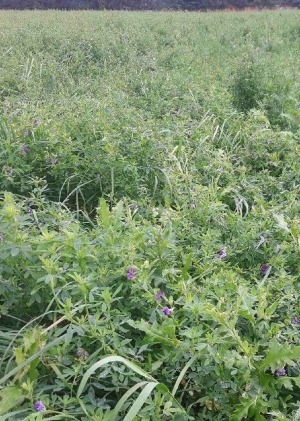 Ideally, we would have cut it already, but with the wet weather have not been able to get into the field. Hay, once it gets mature, starts to flower and then the protein starts to drop and fibre content goes up which makes it harder for the cows to digest. This can lead to lower milk production. Another challenge, is that when we go into a wet field to cut and harvest, you damage the soil structure which will then negatively impact the hay yield for the third cut. Now in our last week of July it looks like we may get a few days of dry weather to try and get the harvesting done. Some animals are happy with mud, like our pigs. 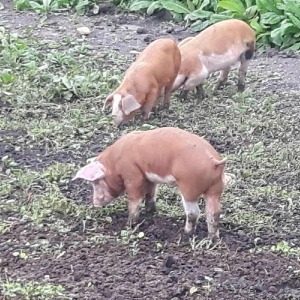 Pigs do not sweat so mud cools them down, and they also like to dig for grubs and roots in it. In Martin's opinion, one of the best places to calf is out in the field. It's clean, there is lots of space and solid footing. There are always risks associated with births, but this was an older experienced cow who gave birth. About 90% of the births on the farm are unassisted. Of the 10% where supervision and/or help is provided half of the cows probably would have been fine on their own. 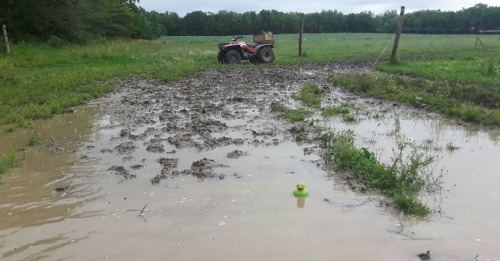 With the help of this rubber duck, we are trying to have some fun with all of the mud and rain. 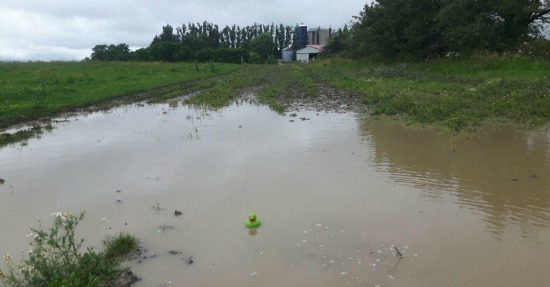 All kidding and rubber duck jokes aside.... life at the farm is a little depressing with all the rain. 1.5 inches again Sunday night. This is a large puddle out in the field, and of course lots of mud. The cows have to walk through this area to go to pasture, and they do not like it. And the rubber duck...well he's going to need a good wash before he returns to his bath tub. In our Main Barn you will find the Luna Brush which the ladies quite enjoy! They enjoy the massage, Martin likes that it helps keep the cows clean and shiny. 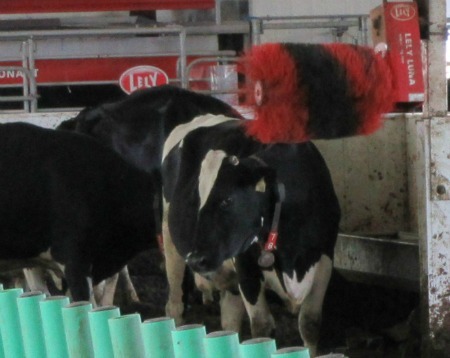 To view a video of the Luna Brush in action in our Main Barn visit here. Each summer we visit and scoop our ice cream at several different events in Ontario. For the weekend of July 14-16 we served up ice cream at the Hillside Festival in Guelph. Here we are on the Friday, getting set up and serving some of our first customers of the weekend. 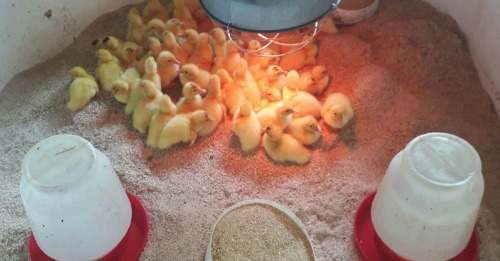 It's July 11th, and Martin has picked up some baby Muscovy ducks from the hatchery. 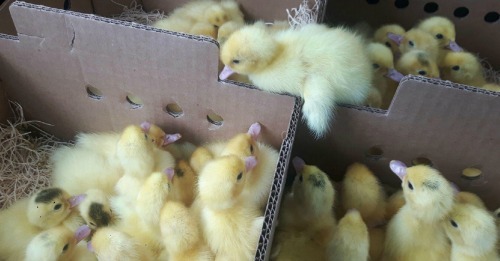 Definitely the term "ugly duckling" does not apply. And here they are a couple of days later enjoying a swim. 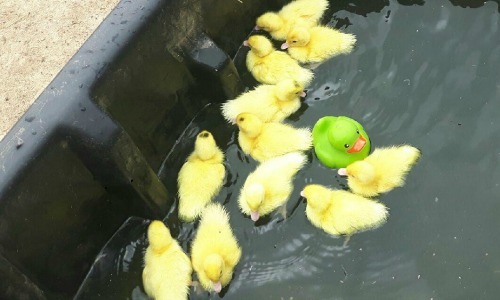 Martin got creative for this picture he took and added the rubber duck.